Fresh from his capture by multi-armed robots, Captain Drew reports to us that the Lost Boys unleashed their 3rd Annual Fan Celebration Concert to a standing room only audience this past Saturday at Push Push Theater. This unwieldy concert footage provides a balcony view of their performance of Tommy Makem’s toe-tapping, fiddle-centric song “Rambles of Spring”. For more information on the Lost Boys’ schedule tune to TheLostBoysOnline.com! The crew of the PiratePalooza™ would like to wish an almost entirely unscurvy life of wedded bliss to Gregg and Susan of the Rambling Sailors, who were wed aboard the fine ship J.&E. Riggin early last month. Take a look at the video put together by new hubby Gregg using photos by Carol Miller and the tune “Beggars to God” by Jim Hancock. The PiratePalooza™ has been fortunate enough to have the Rambling Sailors play for us in the past and we’ll keep our fingers crossed that they be decent enough to cross our decks again some point in the future! We’re pleased to announce that the popular Atlanta-based burlesque troop Syrens of the South will make a special pirate-style appearance during the finale of this year’s Pirate Music Concert, scheduled to run from 6pm to 10pm at the James Joyce Irish Pub in Avondale Estates. We certainly hope that the Syrens legendary love of seamen will show through in this special appearance!! 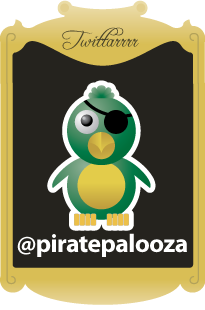 Every pirate knows that PiratePalooza™ is about music and the salty musicians what brings it to us. Whether it be long-hauls, sheet-drags, capstan shanties, stamp-n-go’s, pumpin’ or fo’c’s’le shanties, you’ll find us singin’ about sailing, drinking and wenching. Now, without further adieu allow me to announce our line-up for the 2008 Pubcrawl!! Tenpenny Travelers – the Travelers first climbed aboard the Palooza last year and were a genuine hit with our crew, with many demands that they return to us again! Joni Minstrel – keep an eye on this clever little trouble-maker (and admittedly awesome entertainer), she’ll be sure to be plotting mutiny at some point in our voyage. Ian O’Donnell – with us since the 2nd Palooza, this feller will have you tappin’ your toes and singin’ along in no time flat! We’ll of course greatly miss The Lost Boys and Three Quarter Ale this year, but are buoyed by the fact that they’ve all become massively popular and cannot escape the (lucrative) bonds which will bind them during this year’s Palooza. We do hope they’ll speed back to us next year, itching for rum and rummy-tum-tums…. whatever the heck those are. 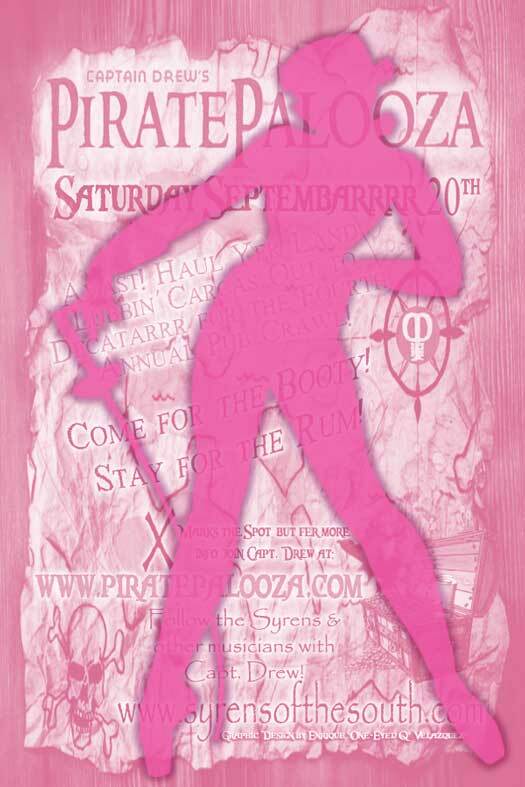 Excited about the upcoming 2008 PiratePalooza™ Pubcrawl?? Here’s a great raw clip from Sandra Sparks’ documentation of the music of the 2007 PiratePalooza™ Pubcrawl Concert to tide you through…. The two person group doing the singing are Susan Hickey and Gregg Csikos and are called The Rambling Sailors, and have fans all around the U.S. rennfaire circuit. If you’re worried about the quality of the sound system for this year, we’ve been told that the mega-beefy sound system from the stadium rock Palooza of 2006 will be making a return! Be sure to let Sandra know how much you’ve enjoyed her videos!! It be no small secret that I likes ambling down to the Trader Vic’s on Thursday nights just to hear the Tiki band Tongo Hiti play the sweet, sweet music of the Pacific isles for wandering tourists and lonely conventioneers. If you do make it down there tell Big Mike that Captain Drew sends his regards… but be warned: as the night grows long and the rum begins to dwindle the music begins to change over to something far more sinister….. Being as I, Captain Drew, are a genuine space pirate, it should come as little wonder to you Earth lubbers that I be having a serious interest in the doings of a minstrel troupe what calls themselves “They Might Be Giants”, particularly when they gin up a handy little ditty for the Walt Disney Company what involves Davy Crockett and Outer Space and be called (uncoincidentally) “The Ballad of Davy Crockett (In Outer Space)” [now available on iTunes for US99¢]. 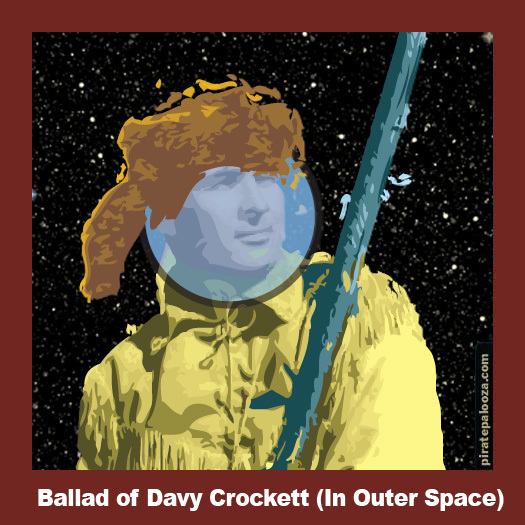 As there’s yet to be any official artwork or videos for this ballad at the time of this arrrticle, I’ve done taken the liberty of grabbing old Fess Parker‘s gob and stickin’ it into a space suit just to convey the idea of Davy Crockett in space. I don’t reckon old Fess’ll mind much as he’s got his own winery. 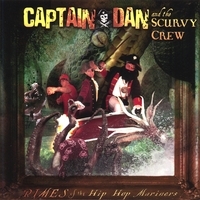 All you pirates in the crowd raise your hooks in the air, today Captain Dan and his Scurvy Crew announced the release of their second album, “Rimes of the Hip Hop Mariners” and I have to tell you that your old pal Captain Drew is very, very excited!! If you don’t already own a copy of Captain Dan’s first album “Authentic Pirate Hip-Hop” you don’t even know what you’ve been missing. Have you ever found yourself sitting at a red light in your tricked out autocarriage, watching all those fine ho’s doing the Bankhead Bounce for the gentlemen in their tricked out Lincoln Navigators? 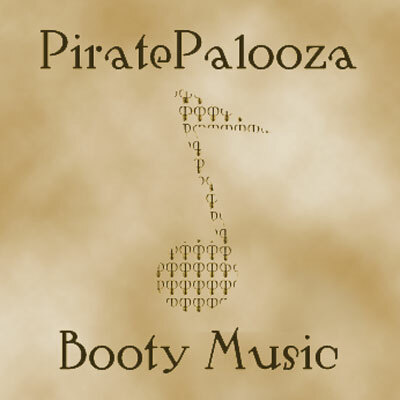 Didn’t you wish that you had some sort of pirate-themed hip-hop music of your very own to attract a gaggle of gals with great big flappity-flapjack fannies to clap booty all over your face? I sure know that I’m constantly making that wish (but then I’m an arrogant space pirate who doesn’t recognize the demeaning social impropriety of my actions). Well you bootyclap-loving lads, wish no more. Click on over to the CD Baby website now to buy your very own copy of Captain Dan’s latest work and get to rubbin’ your faces all up in that junk…. you can thank me later. From a distance. After you’ve had a bath. Maybe not even then. You should probably get shots. And a salve. You know, just in case.